Six Degrees is in many ways a modest little café on the busy London Rd. It serves excellent coffee from Leicester’s St Martin’s (soya and oat milk available for vegans), lovely cakes from “a lady in Wigston”, a nice line in freshly made sandwiches (bacon, brie and sweet chilli, peri peri chicken etc) and light snacks. But what makes it particularly noteworthy is that is that is run by the Leicester charity Open Hands Trust and 100 per cent of the profits go to helping vulnerable and underprivileged local people with clothes, food, furniture and help with issues such self-esteem, English language and pre-school provision. There’s a small core of paid staff backed by a team of 30 volunteers, who range from retired folk to youngsters seeking a bit of work experience to regular customers who just like the idea and want to contribute. The shop was apparently a dream of manger Hazel Nash – as in she literally had a dream about running a café – which chimed with the ambitions of the charity. It’s been open for just over a year and the combination of social enterprise and friendly, accessible environment is popular with students from the nearby university (free Wi-Fi available), local business people and those coming and going up and down the London Road. They’ve been so busy they already converted their basement into a cosy extra space. What’s good is that it doesn’t come across as either worthy or done on the cheap. “People say to us – ‘this is so nice but you’re raising money for charity – how does that work? !’,” deputy manager Katherine told me. And the name? An allusion to the “six degrees of separation” meme and hence an allusion to the idea that we all connected. Just to add if you are in New Walk area you should also consider popping in to the regular Thursday lunch-time pop-up café at Soft Touch, 50 New Walk. I’ve been a trustee of Soft Touch for many years and can bear witness to the tremendous work it does using the arts and creativity with young people. Look here for more info. Huge thanks to those who attended and many congratulations to the White Peacock. 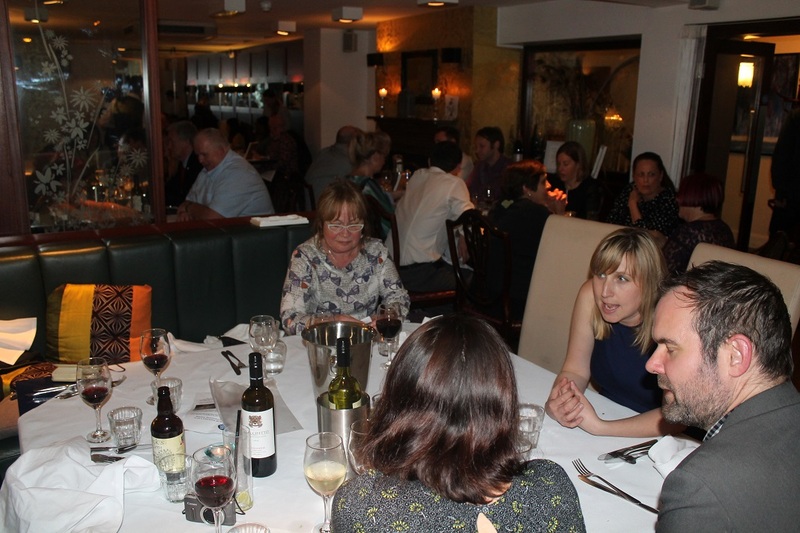 Last night’s event for Soft Touch was not just a cheerful evening of great food but a highly successful fundraiser that will enable the charity to complete the kit-out of its kitchen training young people to prepare and enjoy and healthy food. And elsewhere in the City centre during the same evening, the restaurant was carrying off the Taste of England Gold Award in Leicestershire’s Excellence in Tourism Awards – with a highly commended going to 34 Windsor St. (Not to forgot my friend, and reader of this blog, Richard Buckley who, not surprisingly I think we can agree, helped win the “tourism experience” of the year for his leading role in the reinterment of Richard III). With front of house manager Charlotte off at the awards, the young White Peacock team managed to serve a six-course menu to more than forty people with admirable skill and elegance. The menu showcased great produce and a fine intelligence in dish construction. 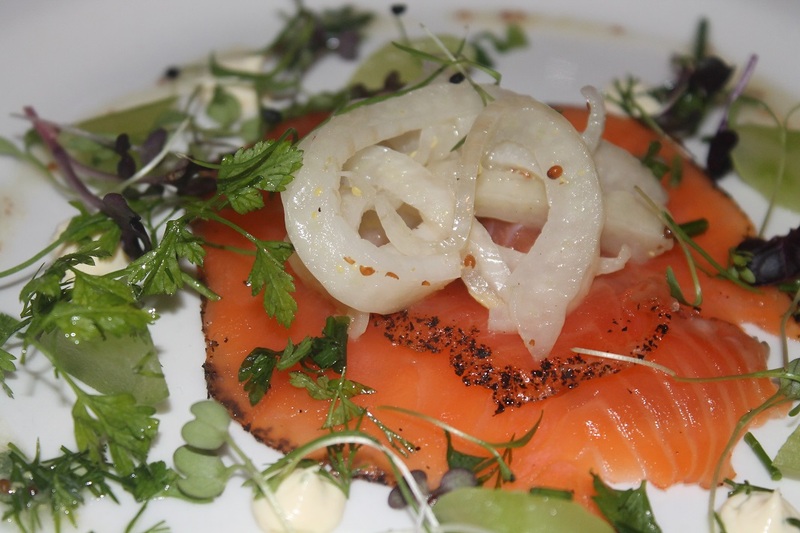 Highlight of the evening for me I think was gin and Earl Grey cured salmon – thick cut, lightly cured fish with a sweet edge and which sang of the sea. It was really effectively matched with slightly astringent pickled fennel, a tangy citrus crème fraiche and pared cucumber. 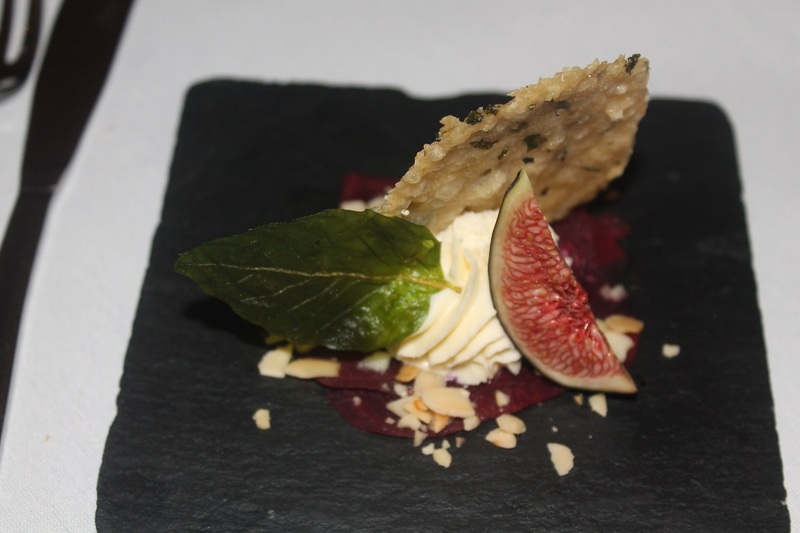 Picking up comments from others there was clear enthusiasm for the elegant starter of pickled beetroot with goat’s cheese mousse and a parmesan crisp and fig, which converted at least one person to the possibilities of the much abused beetroot. Another well-balanced dish that showed how a few fine ingredients can combine to really great effect. 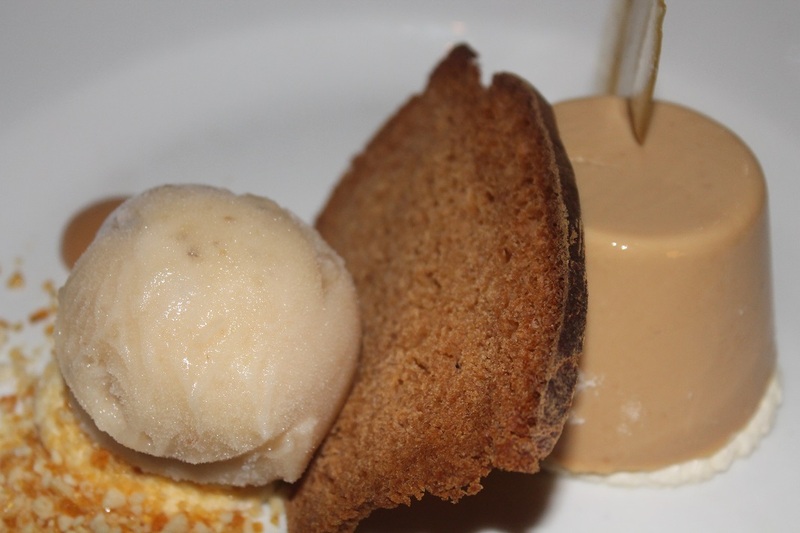 The desert of salted caramel panna cotta, toasted banana bread, banana sorbet and praline was a tour de force finish, the sorbet in particular getting people very excited. 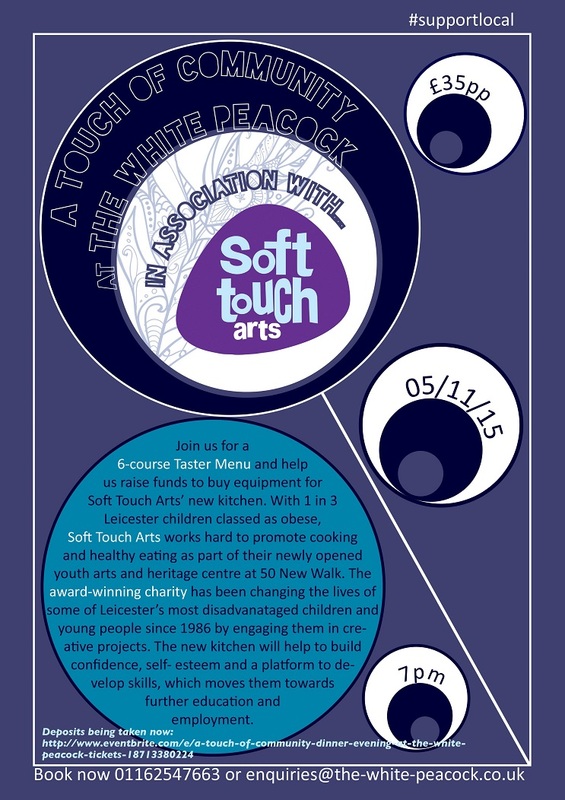 I’ve written on here some time back about Soft Touch, a charity of which I’m a volunteer director that does fine work with young people using the arts, including work on healthy eating and cooking skills. In recent years the organisation has had some great support from Phil Sharpe and his team at the White Peacock, now our near-neighbour on New Walk. Phil has now kindly offered to host a fundraising dinner for us on 5 November which, among other things will help us to complete the kitchen we’ve installed at our new premises and which we will use to help young people learn new skills, improve existing ones and enable the projects we run to prepare food for each other. So here’s the deal – there’ll be a six course taster menu for £35. The menu is yet to be confirmed but if you’ve read this blog, you’ll know the quality of the food at the White Peacock. You will also have a chance to win some wonderful prizes donated by local businesses in a fundraising draw. I’ll post a reminder nearer the date – if there’s tickets remaining – but do feel free to book now. There’s just a £15 deposit to pay – the balance being taken on the night. It’s always good to see a serious new independent restaurant open in the centre of Leicester. It’s been a bit of a graveyard of dreams but there’s always the hope that someone will make a new place work, and so a big welcome and good luck to Phillip Sharpe’s new venture The White Peacock. He’s no stranger to Leicester having been head chef at Maiyango for what must be around a decade. It’s been good to see his development there in producing ever-more ambitious and high-quality food as the young business grew. Now he’s getting his own venue at the foot of New Walk, the building that was most recently Barrington’s but before that was Flores, a fine-ish dining global tapas place that looked beautiful but I never really warmed to the food. I’ve not got details of what exactly the offer will be The White Peacock, but it’s set to open by the end of October I believe. Certainly they will be hoping to capture some of the Christmas action and the festive menu features dishes that seem to reflect the eclectic influences Phil implemented at Maiyango – Japanese green tea and lime cured organic salmon, micro cress, wasabi crème fraiche; organic rump of lamb, slow roast shoulder, root vegetable dauphinoise, redcurrant and rosemary jus; mandarin and hazelnut jelly, hazelnut ice-cream. Phil also comes across as a really genuine sort of chap – committed to using great Leicestershire produce where possible and he and Maiyango have also recently been offering great support to a youth arts project I’m involved with called Soft Touch which is helping disadvantaged kids to develop healthy eating awareness and spread the word in their communities. It’s great he’s having a go in the city centre – I’ll give more news as and when. When I’m not leading the exciting life of Leicestershire’s sixth best food blogger, one of the things I do is sit on the management board of Soft Touch, Leicestershire’s very best participatory arts body. 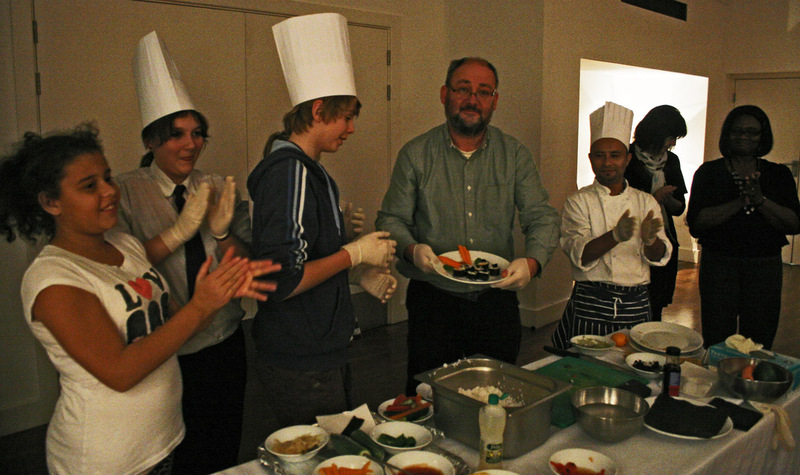 Last night we had our AGM – and before we settled down to look at balance sheets, draft policies and so on we were treated to a lesson in sushi making by young people from the Well Cool group in New Parks. For those not from Leicester, this is not exactly an area famed for its sushi bars, farmers’ markets and cafe society. But these young people, a mixed group and including one not actually welcome at school right now, responded really positively to this Soft Touch project designed to encourage them to look at health and nutrition in their food. Over the last year the Well Cool group started with easy wins like fruit smoothies (made with a pedal-powered blender) and have gone on to develop tasty and fresh recipes which they’ve prepared at a number of community events. They’ve also produced colourful recipe cards for dishes such as Primary Mess – a low-fat yoghurt version of Eton Mess developed for New Parks Primary, and vegetable pasta with a low-fat cream cheese and herb sauce. For our meeting they had had an earlier masterclass in sushi making from one of the chefs at Zucchero on Charles Street, which they then ran with us on the Board. It was really great to see these young people’s enthusiasm as they had their horizons widened though taste sensations such as wasabi and caviar (well I think it might have been lumpfish roe or similar but it’s a start). And here’s the proof – a round of applause for my humble efforts. Big thanks to the Well Cool guys for their contribution to our meeting and congratulations for their efforts in spreading the word in their communities that it is possible to prepare tasty and nutritious food on a budget.